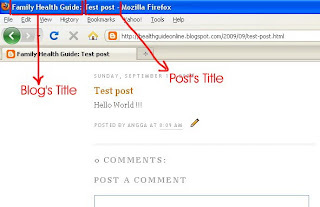 trying several title tags tooptimize my blog and evaluating its capacity. As far as I know, this is the best title tag optimization I've ever used. title tag is the important thing to do. Title tag describe yourblog title. tell to others (to robots and humans) what is your blog about. title on the top of your browser. By default, blogger's title tag is <title><data:blog.pageTitle/></title> As result it will show "yourblog's title"
on homepage and when you open your post, it will show "your blog's title: your post's title" (See image below).